The next time you’re in Barcelona, add one more stop to the list of Antoni Gaudi buildings to visit. 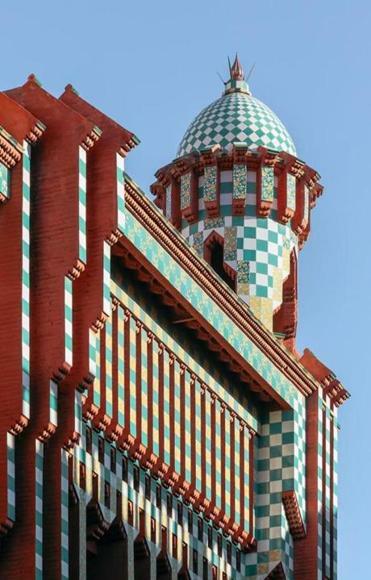 After years of repairs, Casa Vicens, the first house designed by the city’s defining architect, will open to the public for the first time on Nov. 16, with advance tickets already on sale. While Gaudi is most famous for Sagrada Familia, his unfinished swirling cathedral, he designed many buildings in and around the Catalonian capital, from relatively standard works to the more asymmetrical, organic, even surreal buildings he became known for. Casa Vicens, a Unesco World Heritage Site since 2005, fits into the latter category. The four-story eye-popping building was designed as a summer home for a stockbroker as Gaudi’s first notable commission when he was in his early 30s. Built between 1883 and 1888, it boasts fanciful turrets, brightly colored tiles, and wedding-cake ceilings. Over the years, various property owners had altered the space. After decades of being in the hands of the same family, Casa Vicens was sold to MoraBanc, which has spent millions on the building’s restoration and transformation into a museum complex. In Casa Vicens, Gaudi experiments with concave and convex spaces, lights and shadows, and colors and textures typically found in Moorish architecture. Natural shapes and elements also influence his work, seen here in such touches as a cast iron grill entrance depicting a palmetto leaf and ceramic tiles adorned with marigolds. More nature-themed decorative arts, including wrought iron, painting, ceramic, woodworking, intricate molding, and murals, fill the interior. The restoration created several spaces for visitor activities and exhibits, including a welcome area, bookshop and café. Also accessible are the property’s gardens and walkable rooftop. CASA VICENS Carrer de les Carolines, 20-26, Barcelona, www.casavicens.org. Open daily excluding major holidays. General admission is $19; for people 65 and older, students under 25, and children 7 to 18, admission is $16.50. Children under 7 are free.